Morning! I retired end of 2012 at age 55, and left my 401K alone with my previous employer & administrator. Today, my 401K is over $800K. Conventional media (Kiplinger, Money, etc.) and most financial planners say immediately roll a 401K from prev employer into an IRA. But why??? I am considering rolling the two index funds in my 401K over to IRAs at Vanguard with equivalent index funds. But, the fees at Vanguard are actually slightly higher than in my 401K. For this reason, and the flexibility to withdraw funds without tax consequence prior to 59 1/2 (since I'm retired), I believe my better option is to leave my 401K alone. Second opinion please? Any advantage to rolling 401K into an IRA at this time (other than commissions to a new advisor)?? I have some foreign income this year (2103) and I paid tax for it overseas (2000 USD). I learned that I can take a Foreign Tax credit (FTC) when I file tax in USA. But, According to turbo tax, I can take only about $1200 in 2013 and has to carry forward the remaining to future tax years. But, I'm not sure whether I would have foreign income in 2014 or in future years. If I never get any foreign income in the future, would I able to 'use' this carry forwarded FTC somehow ? How can I determine how much money I need now, to cover medical expenses for my wife and I for the rest of our lives? We are currently 54 & 57 years old. Hi billie. I'm afraid I'm not familiar with either of those companies but I have clients who like to play the market with individual companies and I tell them it is okay as long as it is with money that they can afford to lose. You said you don't need the money but your cost basis and how you feel about holding on to those stocks should guide you in making your decision. Hi Connie -- Your questions today were fielded by advisers Brent Perry, Bobbie Munroe and George Middleton. I currently invest in a managed account program through my employer. I hose to pay a little extra for a managed account instead of using a Target Retirement Fun in my 401k. Is it wise? How could I compare returns on those investments versus Target Funds? Hassan: You can use a total bond index, but first look at it's holdings. Often holdings cover government, mortgage, international, corporate bonds, high yield and others. If you don't feel the bond index covers different type bonds then you could look into individual funds that cover the areas mentioned. You could also have an advisor help you create a bond ladder that matures over many years. I have a question pertaining to student loans. There are a few questionable loans that I received through my school that I don't recall actually physically signing for. The lender has shown me a promissory note with an e-signature. I have read somewhere that for student loans a "wet" signature was needed. This was according to an act the was signed into law when Clinton was president. IS there any truth to that? These are extremely high interest rate loans that I need to take care of somehow. Have the option of tax free or taxable funds into my 401k. Have are guidelines that I should follow? Also when I begin to withdraw funds, which should be first taxable or tax free? Any general thoughts on how much international funds (%) should be a retirement portfolio...I am 46 years old. Overall, how is the international market related to the USA stock market? Is it a true diversification or not? Hi Sky, if you do decide to invest in some Kiplinger 25 funds (which are our favorite no-load mutual funds), here are some model portfolios for you to consider. Hassan, the 20% stocks and 80% bonds at age 80 is a rule of thumb which may or may not apply to your situation. The total bond index is a viable option, but as you indicated, it is a good idea to diversify even further with other asset classes such as emerging market debt. Thank you to everyone who has submitted questions so far today! We're answering them in the order in which they are received, so if you don't see yours right away, don't fret. We will be getting to them as soon as we can. All answers will also be available in the chat transcript later. rr (and everyone interested in Roths! ), here are the Basics of Roth IRAs. Jason, I really don't know what todo about those loans, but talk to the college? Hi Philly, the managed account provider, who works in partnership with your 401(k) should be able to provide this information and compare your performance to benchmarks. And this information could already be there on your 401k statement. You can always look up the returns on target retirement funds by visiting the fund company's website. My husband and I each have 401k's available in our workplace, and we are each contributing the $17,500 maximum each year. We also contribute the $5k max to a Roth IRA, although we'll be phased out next year due to income. Is it possible to also open a Traditional IRA to have more tax-advantaged retirement savings, or are we limited to having a taxable brokerage account for additional savings? We are relatively high income, no kids so looking to max out retirement savings while young. Thanks. Hi Tom. The usual withdrawal order is savings, taxable stocks and bonds, retirement funds (don't forget those reqiured distributions at 70 1/2) and pulling up the rear is tax deferred and tax free. Having said all of that, it really depends on your situation. If you are in a year when you are in a high tax brackett and need supplemental income, tax free might be the way to go. Other times you may need to make a special purchase like a vacation or a vehicle. Tax free can pay for those items without increasing your tax liability. Dennis: The amount held in international funds will vary depending on your allocation and advisors vary on the % to hold. Generally between 9 and 25% stock funds. It used to be that the US and International markets were not as correlated but over the last few years they very much follow each other. That said holding international funds does still diversify your portfolio. InvestopediaLearn the requirements for withdrawing funds tax and penalty free. It will give you good examples of how any tax and/or penalty on ROTH withdrawals is calculated. Kiplinger, I'm sure you have an excellent article on this topic. Chris, Walt has actually signed off for the day. We will see if any of the other advisers can respond! Jason B. I can't speak on the need for an original ink signature or e-signature. The bigger question is whether you received these loans or not. You'll need to dig through your records to determine which loans were paid for your school expenses. Then, dig deeper into the loans that you can't determine where they came from. Another clue could come from your credit report which will show dates of the loans. You are entitled to a free copy of your credit report each year from www.annualcreditreport.com. I am 24. I have a 401k, but i'm trying to decide if I should have a whole life insurance policy as a means of retirement money when I'm older. I'm worried that as my expenses increase in the future, the monthly payments may hold me down. Any suggestions? HI KG, for 2014, the maximum you can contribute to all of your traditional and Roth IRAs is the smaller of $5,500 ($6,500 if you’re age 50 or older), or your taxable compensation for the year. So if you have maxed out your 401(k)s and IRA options, you may have to save in a taxable brokerage account unless your company provides a non-qualified deferred compensation plan. Dennis, countries outside the US are capturing a larger percentage of world GDP each year. How much to put into them depends on your specific circumstances, but it is a good idea. Remember, however, that the companies in the S&P 500 do a tremendous amount of business worldwide so that alone provides international exposure. I would sit down with a financial advisor to determine the asset allocation that is right for you. I'm 32 Federal Employee with 11 years of service. I just reviewed my TSP(401k). My balance is 112k. with my FERS Pension, SS, TSP. and a ROTH(28k). Am i on thed right track to successful retirement. Or is there anthig more I can do? I have seen the proof of these on my credit report already. the issue is they are at 16% and 14% interest and I don't recall applying for them myself. The school had some questionable practices, so how am I to know that someone from their financial aid department didn't just type my name into the application? I know they were paid to the school on my behalf, just not that I would have accepted such a high rate loan, and my credit rating was not very favorable at the time either. DJ, don't fall for that whole life investment trick. Life ins is for those who have dependents. Maximize your 401k, When you have a wife of kids consider a 30 yr term policy. Simon -- Will you give that a try? I might have gotten cut off. Thanks! DJ. As a 24 year old, don't bother with whole life insurance. Focus on getting the maximum employer match in your 401(k). If your 401(k) offers a Roth 401(k) option, consider that assuming you are in a lower tax bracket. 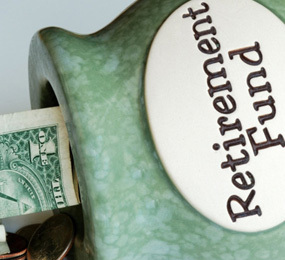 Beyond the employer match in a 401(k), open and fund a Roth IRA. Both the Roth IRA and Roth 401(k) grow tax free for retirement. A life insurance policy grows tax deferred and may have some tax free benefits, but the fees and insurance expenses will eat into your returns. When you need life insurance to provide for a spouse or kids, purchase a 20-30 year term policy. Carlos, you're not giving us the whole picture. Other considerations include how much are you spending (or will spend), your expected retirement age, how much you plan to add to retirement in future years. A financial advisor could help you with it or you could try the retirement calculator featured at Kiplinger's. Jason, so you do owe the money but are concerned about the interest rate. Have you checked to see if you can refinance these loans? Hi Chris. I found your original question to Walt. Yes a personal account is like something you would set up with a discout broker like TD Ameritrade. You can buy stocks bonds and just about anything else but I suggest you stick to well diversified mutual funds like the KIP 25. As for cap gain rates, short term rates on securities held for less than a year are the same as your ordinary income tax rates. Long term rates on securities held for more than a year are taxed at 15% for somebody in your brackett. Here is our Retirement Savings Calculator George mentioned. I am putting together a pretty risky portfolio as I have 25 years to work with and I am fine with the ups and downs. It is a 403b through work, using all Fidelity funds. 1. These are in a Traditional 403B. I tried to pick tax efficient funds because I don't want to receive 1099s. Did I succeed? 2. All the allocation calculators I have used, recommend 20% foreign funds. Do I really need them, and why? 3. Some research I have read says to go with no more than 10% in sector funds, I have 20%. Not all research I have agrees and asys 20% is fine. What say you? 4. Although I am ok with risk, and I understand things will go up and down, are my picks insane? I am at stay at home mom 41 and husband is 43. Current income is $195k we have about 350K saved for retirement and Save about 34K per yr. Not debt except mortgage 220K house is worth 390K. My husband self manages our money and investments are almost exclusively in low cost etf. However they are all equties and very little bonds. My husband thinks because we are 20 years way from needing this money we don't need bonds and is convinced we are heading for much higher interest rates. He also thinks we can have several million dollars saved if we keep this strategy going. Do you think it is too aggressive and are his expectations realistic? What is a normal range for a one-time meeting with a fee-only financial planner? My husband and I are both pretty good with money and savings, but could use a checkin to make sure we're maximizing everything. We can have a phone/Skype meeting with a planner from Vanguard for $250, and everywhere else I've looked has been minimum $1,000. Jason B. It sounds like the loans were used for your education, so you owe the money. Check on what type of loans you have (Stafford, etc.) and refinance to a lower interest rate.